Impress your dear ones by sending this Sporty Ben 10 Designed Stationary Set and elegantly brighten up their mood instantly. 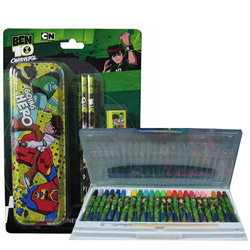 This lovely Ben 10 Design Gift Set is added with One Green and Yellow Colored Stationary Set and ultimate Alien Oil Pastel 24 Pc. Color Set for Kids who loves to Draw and Color.